Fall ushers in cooler weather, football, apples, pumpkins and a whole slew of new date ideas. Don’t sit at home and let this time of year pass by, get out and enjoy it! Here are some fantastic fall date ideas you won’t want to miss! Apple Picking – This is the classic traditional fall date! Head out to the orchard, and enjoy a hay ride into the trees. Walk along the rows hand in and hand pick apples. Then enjoy the hayride back to the front of the farm. Head home with your apples and spend some time making applesauce, apple butter, apple pie, apple cookies, apple cider and more. If you don’t have recipes of your own, you’ll find Pinterest is full of great ideas! Horse Back Riding – Take a horseback ride and enjoy the fall foliage. Many stables have scenic trails available. This is a great way for outdoor enthusiasts to enjoy the weather, nature and each other! Plus, it’s good exercise! Fall Foods Feast – Are you a Foodie? Hit the local festivals and restaurants around town, and try all the new fall foods. Even the national chains come out with fall pumpkin and apple foods. Try everything from pumpkin coffee, apple and pumpkin pancakes, apple salads, apple and pumpkin desserts and everything in between. Tailgate – Football season comes in with the fall weather. Head to your favorite team’s games and tailgate before the game. Make some friends, and enjoy delicious tailgate food. If your favorite team isn’t playing locally, consider hosting a tailgate party at home and watch the game gathered around your TV. Star Gaze – What could be more romantic than snuggling with your honey under the clear sky, watching the stars? There are many apps like SkyView that help you locate stars, planets, and constellations. Bonus: depending where you are you might catch a glimpse of the northern lights! They are seen in many states as far south as Virginia! And did you know Ohio has one of the few Dark Sky Parks in the country? There are only 20 of these parks worldwide that offer superior viewing due to the lack of light pollution. Power Outage Date – You don’t need to wait for the power to go out for one of these. Fall is the perfect time with great weather to create your own. Turn off the lights, use candles and prepare your food on the grill. No TV or radio, play board games or card games and tell stories or just talk. These can be some of the most memorable nights because you can really connect. Play Tourist – This is probably my favorite fall date idea on this list. Take a day trip and check out a new town and be a tourist. Walk the local shops, try out the local restaurants, talk with the locals, see the sights and enjoy a mini day away. What are your favorite fall dates? Love these ideas! I love playing tourist where we live (NYC) – my husband grew up here and I’m from Pittsburgh but I seem to know so much more about what’s going on and introduce him to many new fun things! 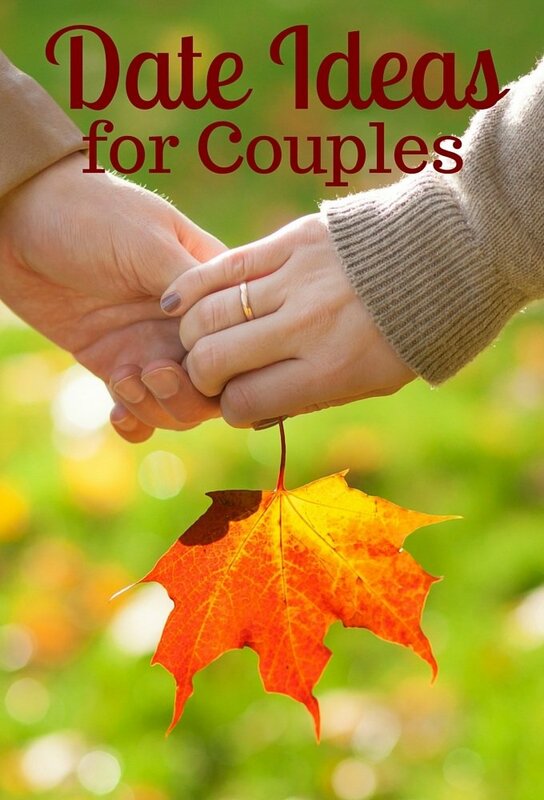 I love these fall date ideas! We go to the pumpkin patch every year which is fun. We also go on a family trip to the mountains every fall; this year I’d love to have a date day of hiking and/or canoeing while we are there! Hiking and canoeing sounds like a lot of fun! And so does a mountain vacation. I love each one of these suggestions. Don’t forget just taking a stroll just before sunset to admire all the beautiful Fall colors that are coming into play. I love taking my kids to the park and the two of us just watching them and walking around the area. I’m loving your ideas. We really need to plan one soon. We do dinners a lot but that’s about it. I’ve never been apple picking. I would love to go with my husband for a fun fall date. My husband and I do a corn maze every year. We do one with the kids, but we always do one alone, too. They are so much fun.